Hi, servus and welcome to a summer special challenge reminder that is a little different from the ones from the last years. 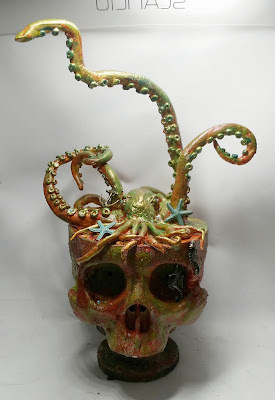 As the whole team have already posted their makes on the 1st of July (HERE), I thought I could use this opportunity to look back at the very beginnings of this challenge blog and pick some projects that deserve to be put into the spotlight again. All the details and the collection to enter your projects for our summer special challenge into, can be found HERE (or by clicking on the badge on the top of our side bar). There is still time until the end of August to enter up to five makes (instead of the usual three) to try to win one of our two fab prize bundles that will be given away by lovely Glenda from boozybear and DecoArt media. But let's start with our throwback in time! Sandra and I founded this challenge blog and soon started having special guests (so there were more than just two "design duo" projects). I still remember having lovely Candy Colwell as our guest in our very first year. 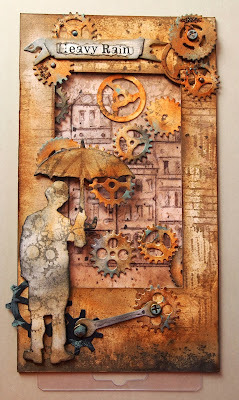 The little miniature dresser made for our "matchbox steampunk" challenge was just breathtakingly amazing and so beautiful! 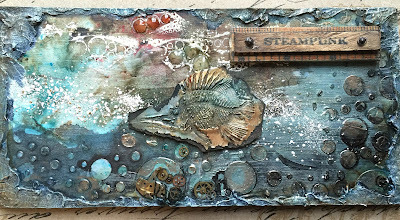 Karolina Stopyra aka Drycha was our guest in June 2013 and created this adorable steampunk fish card with cogs scales for us! 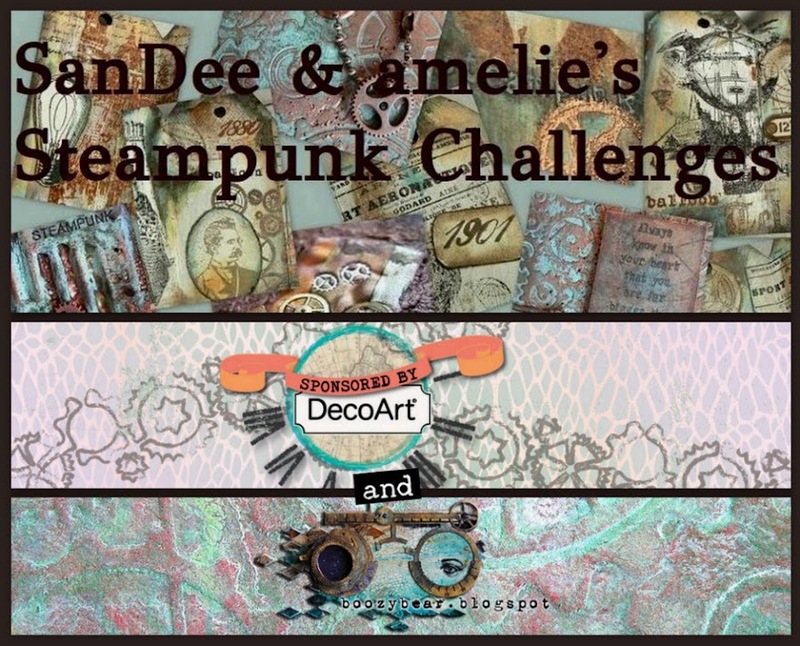 Sandra, whom I still miss dearly, was the one who had the idea of setting up our own mixed media steampunk challenge blog - so we actually owe her this wonderful creative spot! I am so happy that she made me do this! 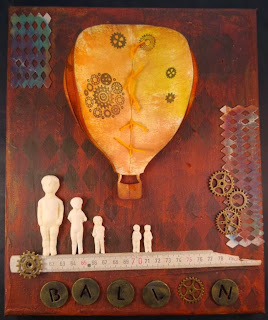 She sadly had to turn down her creative hobby and we have lost touch. I hope she is happy and doing well! In March 2014 Susan Janicula aka klistersoster joined the design team (and I am so happy and proud to tell that she has been with us since then!) 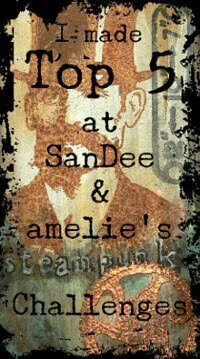 with this cool steampunk steampunk card. 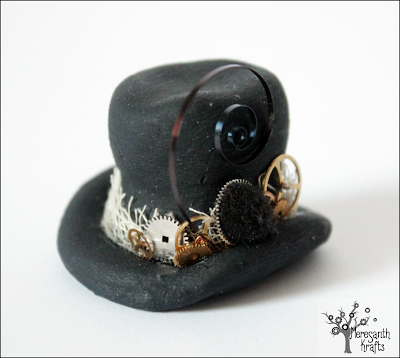 And I am still in love with former design team member Agnieszka's adorable steampunk bowler hat! Wonderful Maura has rejoined our design team some time ago - which has made me very happy! 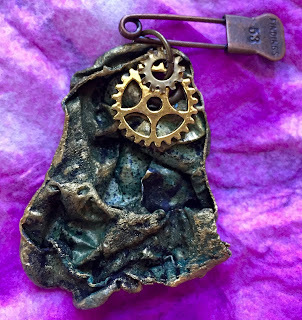 She has been making the most inventive and funniest projects ever since - like this Tyvek charm she has created from used envelopes and acrylic paints and media. And my wonderful and dear friend Laura was part of our amazing design team too! I miss her and her wonderful projects. ...and not to forget about Dee, who has enriched our design team with her unique projects too! Lovely and evenly amazing Alexa was the last talent to join our design team and I am so happy to have her! With all these amazing talents I have had or still have the pleasure to work alongside I can call myself a very lucky challenge blog owner, can't I? 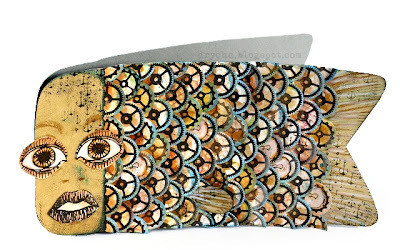 I hope you have enjoyed this little creative time warp as much as I have! 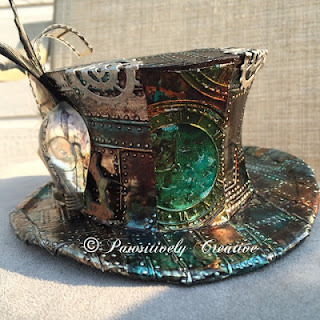 I can't believe that this is year six on my journey as a challenge blog owner! And I can't believe how far we have come! 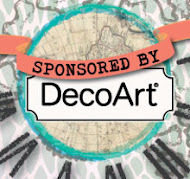 I am so thankful and proud of all the wonderful guest designers we have had and of all our true and fantastic players, who join in so regularly, and I am also thankful for our fabulous current prize sponsors boozybear and DecoArt media, and all our former prize sponsors too! Thank you all so much for helping and having helped making this place the special spot it is today! 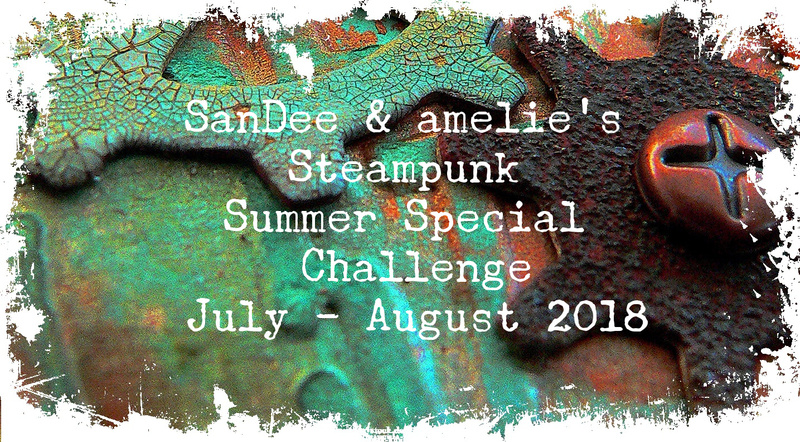 Our summer special challenge is open for one more month and you can simply click on the badge at the top of our sidebar or scroll down to the previous post to learn about the details and to get to the actual DT makes and the inlinkz collection to join in! Thanks for stopping by and happy summer holidays!